Pres. Trump kisses House Speaker Nancy Pelosi (D-CA) as they depart the March 14 Friends of Ireland luncheon. House Speaker Nancy Pelosi rankled some of her supporters when she said “I’m not for impeachment” last week. And apparently, she’s fine with that. A Twitter group run by Pelosi’s political account on Twitter was told that group members who disagree with her position on impeachment should “feel free to exit.” Messages sent from Pelosi’s account and signed by her spokesperson, Jorge Aguilar, were provided to TYT by a member of the group. Screengrabs show a spokesperson for House Speaker Nancy Pelosi (D-CA) defending her decision not to permit impeachment proceedings against Pres. Trump. One group member expressed opposition in no unclear terms. 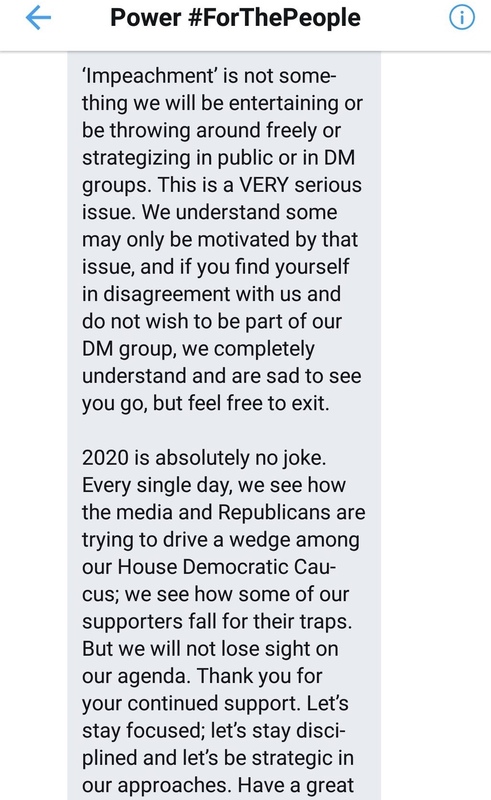 “I’m not a robot and this post from ‘Jorge & Team Pelosi’ seems almost hostile that we should be a conduit or exit,” one account with the username “jason #BoycottNRA” responded before leaving the group. Another group member, Autarkh, took issue with Pelosi’s claim that her opposition to impeachment was nothing new. “To be perfectly fair, she’s the one who said ‘This is news,’” Autarkh wrote, accurately quoting from Pelosi’s original statement. The Twitter group, which Pelosi’s team uses to distribute talking points for members to promote on the social network, is composed of a number of Twitter accounts with large followings, a group member told TYT on condition of anonymity so that they could remain in the group. “We send messaging and social media guidance, including memes, videos, coordinations for tweetstorms, hashtags, tweets to RT/share and the like,” the introduction continues. 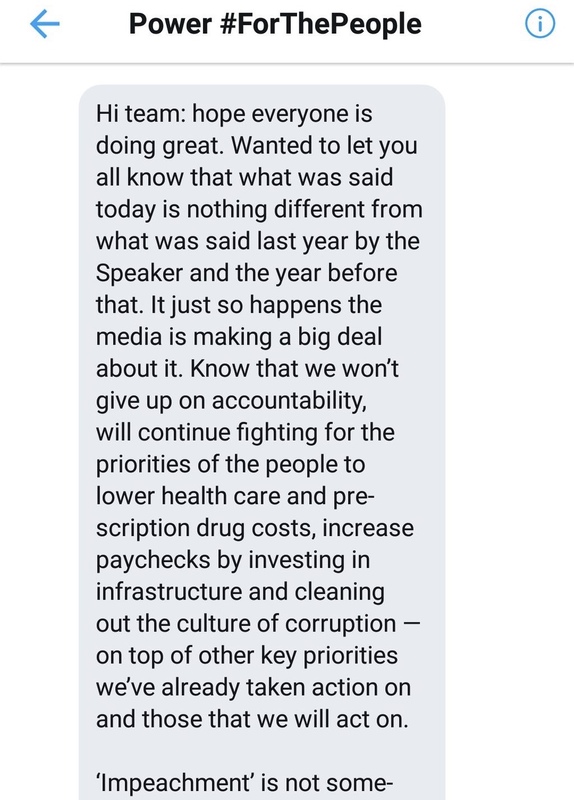 On occasion, Pelosi herself sends messages to the group, signed “NP”. Pelosi’s office did not respond to an email from TYT asking under what circumstances, if any, Pelosi would support impeachment hearings for President Trump, and how many similar Twitter groups her staff runs. This is not the first time Pelosi has balked at impeachment proceedings. “Impeachment is off the table,” Pelosi announced in 2006, after Democrats won sufficient seats to take control of the House of Representatives.